Our 25 weeks journey has come to an end. How do you feel? Do you feel empty? Because I do! The show left such a big shoes for the follow-up drama, Daebak/Jackpot, to fill. 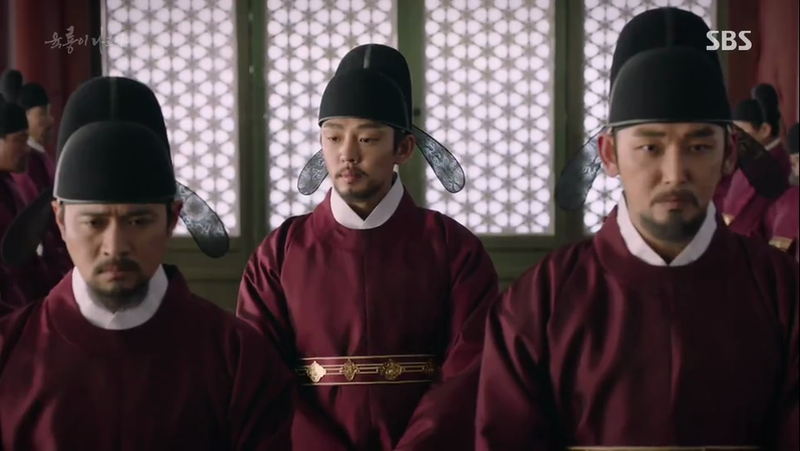 Six Flying Dragons is a very well-made drama. It’s a solid watch from start to finish. The casts do an outstanding job, backed up by tight writing. This 50-ep drama is something you don’t want to miss if you’re a sageuk lover. 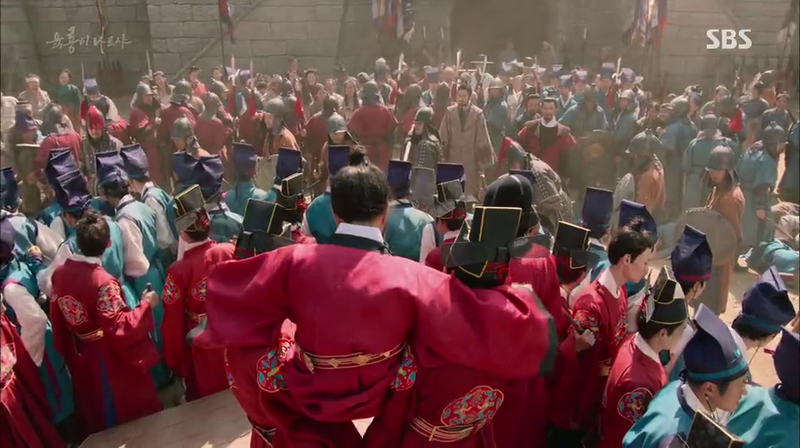 Even if you’re not a sageuk lover, give Six Flying Dragons a try and you’ll get sucked into the story and you’ll find yourself watching the drama to the very end. Satisfaction guaranteed! Should we even start this? The drama is led by a handful of outstanding actors like Cheon Ho Jin, Kim Myung Min, Yoo Ah In, Byun Yo Han, Jo Hee Bong, Park Hyuk Kwon. Don’t forget the villains who died early Jeon No Min, and Choi Jong Won. They did an amazing job in bringing the best of their respective roles. You can feel Sambong’s (Kim Myung Min) disgust at the rotten and full of corrupt Goryo, Yi Bang Won’s (Yoo Ah In) hunger for power, Moo Hyul’s grandmother’s (Seo Yi Suk) worries about her grandchild’s safety. What I want to talk about here isn’t those actors who do great. I want to talk about those who don’t do really great. The first person who comes to mind is Shin Se Kyung (played as Boon Yi). She was extremely great in the first half of the drama. She went back to her “one expression” acting after working with Yi Bang Won and Sambong and kept it all the way until the ending. It really disappointed me. She’s an actress who’s restricted to a small number of roles. Once she fails to choose the best character BOOM she’s going to be really poor on screen. She does an amazing job as cheerful character like in Girl Who Sees Smell and several scenes in SFD. Her acting spectrum is pretty limited so I do hope she will get acting class before taking her next project. She’s still young and has all the opportunity in this world to grow as an actress but she needs to get her acting excelled first. Second, Cheok Sa Gwang (played by Han Ye Ri). I admire her character but her as an actress? Nah. She was pretty stiff in this drama. Some of her scenes did make me cry but she’s just stiff and expressionless. She needs her co-stars to bring the best of her. She can’t do it alone. Third, the child actors. Am I the only one who doesn’t really like them? They are the reason why I skipped ep 2-4. Ok, I watched like 20 minutes of ep 2. Their acting was a little over the top. The young Boon Yi knew nothing but screaming with her straight face. The young Bang Won also knew nothing but screaming every now and then. The plot maybe had a portion of responsibility about this but I do think that if their acting was a little bit more bearable for me, I wouldn’t skip ep 2, 3, and 4. I talked about Yoon Gyun Sang’s lazy gaze before on my TTWWNIL review and how I got turned off by it. I was a little skeptical about his lazy gaze at first but Thank God his lazy gaze wasn’t showing often in SFD. He actually surprised me with how great he was as Moo Hyul. His expression couldn’t be read at times though and that scared the hell out of me. 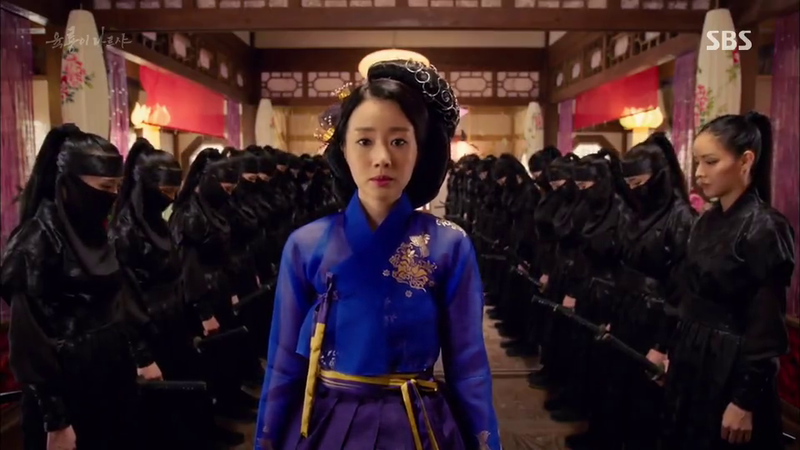 Few times, Moo Hyul questioned himself about Bang Won’s action and political moves. He had doubts. He was not sure about his decision following Bang Won. With Yoon Gyun Sang’s portrayal I couldn’t really read what’s going on in his mind. 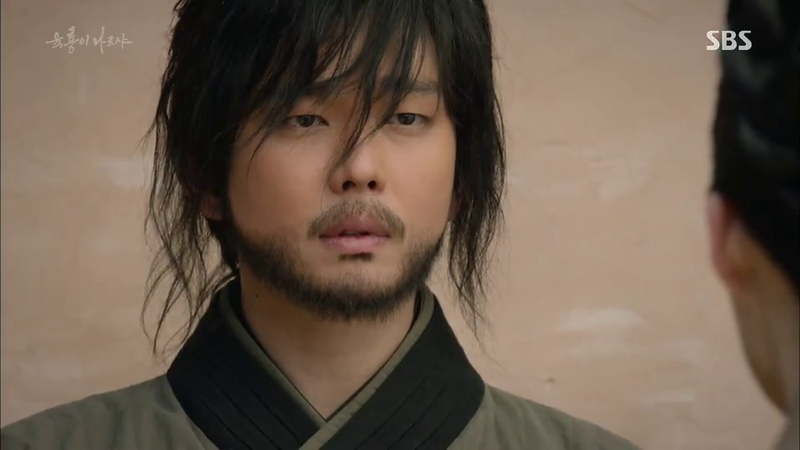 I was always afraid that he’s secretly following Sambong and just waiting for the perfect time to betray Bang Won. I like that even though it’s a 50-ep drama it still managed to give its best in acting, plot, and yes, directing. The quality didn’t drop. Yes, there were some episodes where the scenes looked really dull and out dated but as a whole, the cinematography put me in awe. Some scenes were filmed extremely great and super polished like Po Eun’s death. The fighting scenes were well choreographed. The editing was great too. The editing team surely did their best on every episode and the fact they worked on this drama for more than 6 months but still managed to put out high quality editing just makes me speechless. I couldn’t help but compare it to other dramas, for example Yongpal. SFD kind of reminded me of super poor job Yongpal editing team did on episode 4. I know I always make Yongpal an example of everything that’s bad. The sets were well made even though several sets just made me shake my head in amusement. For example, the royal meeting room. Why was it so small and packed? The costumes were great too! I’m a sucker when it comes to beautiful hanboks. 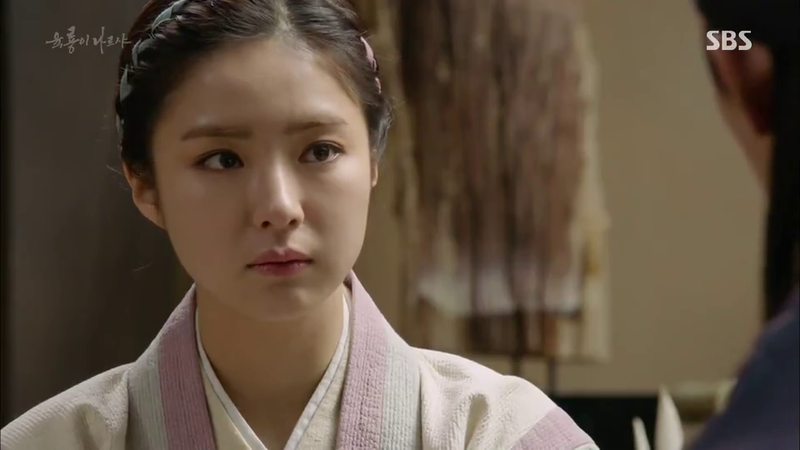 Cho Young (Yoon Son Ha)’s hanboks were all pretty and I had always loved her makeup. It kind of reflected her position as the leader of Hwasadan, Goryo top 2 informant group. The first ep was moving too slow to my liking and wasn’t something out of this world. I didn’t like the pilot episode to be honest. I gave it another try by watching the first 20 minutes of episode 2 but I wasn’t convinced that this was a good drama. The fact that it’d be a 50-ep drama also overwhelmed me. ALSO, the not-so-exciting official promotional poster and poorly done teasers made me considered dropping this, let me be really honest. Maybe because I was already frustrated with the child actors’ acting. If you ask me whether or not I’m going to watch that ep 2, 3, and 4 after knowing how great SFD is, no. I’m still not going to watch it. The child actors annoy me. I picked SFD up again on the 5th episode. I didn’t want to picked it up to be honest. I even prepared a post explaining why I decided to drop SFD and it was ready to be posted on the blog anytime. My friend convinced me to go back and see if it’s really not for me. So I picked it up again. I watched the 5th episode and I liked it much better compared to ep 1. Again, my opinion is (maybe) a little bit too biased and subjective. I wasn’t really familiar with the two writers’ (Kim Young Hyun, Park Sang Yeon) previous works too. I knew they wrote Tree With Deep Roots but I don’t watch the drama because 24-ep drama was TOO LONG for me at that time, which is 2011. The plot got better and better and I’m glad I didn’t drop this because SFD appeared to be one of the most brilliant sageuk dramas I’ve ever watched. It did need time to finally catch my full attention. It took time to introduce and build the atmosphere. The plot was kind of slow in the first episodes because however they needed to fill up the whole 50 episodes so they took their time. The plot got thicker and moved fast after the initial stage which took me like 10 or so episodes. The writers seemed to know to which direction the drama was going and that’s great! Clear vision about the drama’s destination is very very essential and lately more and more drama writers seem to forget it. The two writers, Kim Young Hyun and Park Sang Yeon, managed to fill the whole series with some substance and it resulted in great final product reflected with how many upvotes on SFD articles every week. They worked on the script for 4 years. SFD was supposed to air right after Empress Ki on MBC but things happened and MBC dropped it. Finally the writers secured a slot on SBS and changed the title from Unprecedented to Six Flying Dragons. Since I don’t really remember much about the first half so let me go with my memory. It did get better with time. It’s true that the writers got helped a lot by the history because they followed it rather closely. But the writers still came out with their own ideas and incorporated it with the real history very well. They made a wise use of all of the resources they had. The story had so much impact on later episodes. 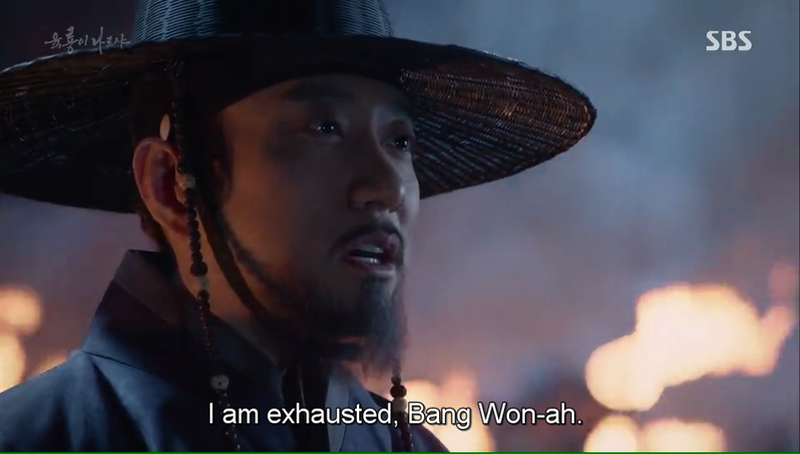 For example on ep 48 when Sambong told Bang Won that he was exhausted. That one line was so ambiguous but had deep meaning. It broke you into a million pieces because you fully understood what Sambong meant by “I’m exhausted”. Moo Hyul’s dragon title!!! I seriously thought the writer totally forgot to give Moo Hyul his dragon title since they seemed to not wanting to give it to Moo Hyul. Every time Moo Hyul had a chance to fight Cheok Sa Gwang or Bang Ji things always happened! Like his grandmother suddenly appeared. Boon Yi suddenly appeared. I knew that the writers’ intention was good. They wanted Moo Hyul to polish his skills more and more but it fell short of expectations to be really honest. 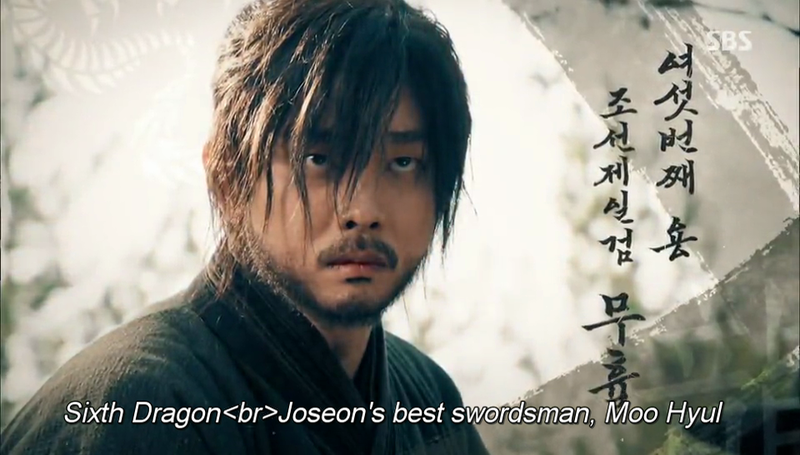 It’s written in the history that Moo Hyul was the best swordsman in Joseon then please make Moo Hyul like one. I was really pissed when Bang Ji was there to fight Cheok Sa Gwang with Moo Hyul on the last episode. Why was Bang Ji even there. No. 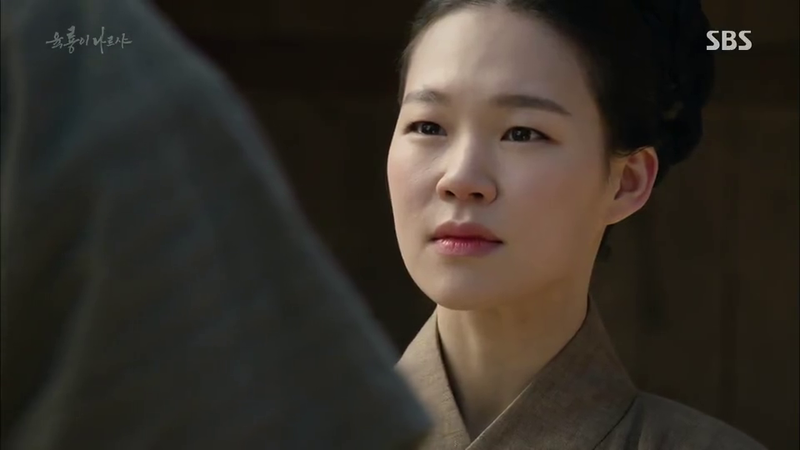 Why was Bang Ji always there when Cheok Sa Gwang brought her swords and ready to fight. 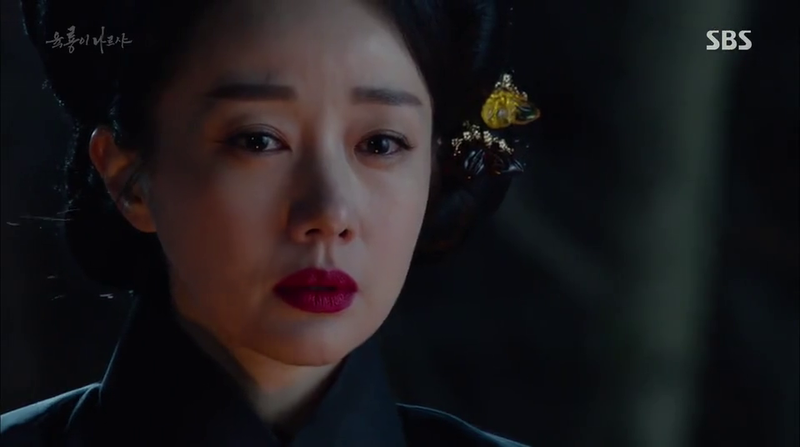 I wanted Cheok Sa Gwang to fight alone with Moo Hyul. Then Moo Hyul can fight with Bang Ji to determine who’s the best swordsman. OR that Moo Hyul and Bang Ji’s cancelled fight on ep 48 should determine who’s the strongest between them. Then Moo Hyul should go face to face with Cheok Sa Gwang. Okay, I sound like a person who’s obsessed with the characters killing each other. But what’s really the point of Moo Hyul’s being left alone in China (I forget the name). He went to numerous wars with them, survived the wars, trained together with those Chinese warriors that’s said to be the strongest and best warriors on earth. Just what was the reason of that if by the end of the day he got his best swordsman title after Bang Ji went to China to save his life. But really, Moo Hyul’s dragon credit was damn satisfying. After 49 episodes finally you got the title you deserved that you should have gotten from long long time ago. Just like the feeling I got when Lee Jae Han was alive on the last episode of tvN’s Signal. I got the same satisfaction feeling when finally Moo Hyul got his dragon credit after all those years. Ok move on. The political moves from every characters was excellent especially Yi Bang Won. Sambong was a great thinker and it reflected in the drama. He got annoying when he got power over the nation and it felt like he was the one who ruled the nation not the King. The King got so clumsy and always depended on Sambong. I knooow that’s what’s supposed to be since it’s a sageuk but Yi Seong Gye that I had always admired just turned into a weak person once he got the throne. I was really pissed with some of the fictional characters like Bang Ji. Again, he just got in the way. I was wondering how the writers would wrap their stories since they were… fictional. It’s pretty satisfying. Boon Yi really had power and presence in the drama and she was one of the very important characters in this drama. The way the writers wrapped Boon Yi’s story just satisfied me. The plot’s peak was definitely nearing the end. When Bang Won’s coup succeeded it felt like the burden just lifted from our shoulders. After 25 weeks being together with SFD, of course you’ll feel empty once the drama ends. It’s hard to find a brilliant sageuk drama like this. It’s been a part of me for 25 weeks and now it has come to an end, I think I need some time to get invested on another drama. I sincerely think SBS did the wrong move by putting out a sageuk right after SFD, on the SAME timeslot. SFD was ah-mazing from A to Z and it’d be hard to compete with that. All characters in SFD was equally important to the plot and none really felt like an extra character. Even side characters like Young Gyoo (played by Min Sung Wook) was so interesting and layered. I haven’t watched Jackpot/Daebak yet so I can’t say much. But judging from the teasers and knetz comments, I think that Jackpot is lacking compared to SFD even though it’s the leader of 21:55 timeslot. We get 3 new dramas from KBC, MBC, SBS on this time slot and none really attracts my attention. What a sad thing. I need to move on from SFD and Signal like NOW! But I can’t. Both were just amazing in their own ways and it’s hard to get invested on a new drama knowing that everything will be pale compared to SFD and Signal.